I first heard about John Holdren's "climate hacking" ideas on NPR a few days ago. The short bit on Morning Edition described Holdren as saying that "we're near a tipping point" of catastrophic climate change, and we might have to take radical action. The two things listed were fake trees to vacuum up carbon and store it somehow (I thought real trees did that?) and shooting sulfur particles into the atmosphere, emulating a volcano, to block the sun's rays. There are some risks, such as burning off the ozone layer, but it's still an option that we must look into. Makes sense, right? Sure, we can't predict the weather accurately, even a few days out, but we have enough certainty to know that global warming is like being "in a car with bad brakes driving toward a cliff in the fog." Yup, the air is now too clean and we need to pollute it, on purpose, to save the planet. Doug Reich digs deeper and finds fascinating parallels between the unfathomably irrational programs of brutal dictators like Mao -- the "Kill a Sparrow Campaign," and handing out fly swatters? -- and Holdren's radical geoengineering ideas. Read his whole post. Smithers: "Well, sir, you've certainly vanquished all your enemies: the elementary school, the local tavern, the old age home. You must be very proud." 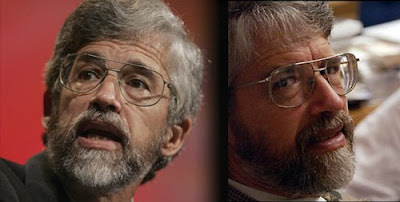 I can picture the crazed professor, John Holdren, cackling with spittle on his beard, as he cries, "Prepare to ignite the Holdren Volcano-izer! On my mark!... FIRE!" Yes, this is a very serious issue, but sometimes gallows humor or a good quote from The Simpsons helps to retain sanity. Awesome post and thanks for the mention. The Mr. Burns connection is hilarious - I remember that episode well - he made a great connection - also, I had not heard that GW was being caused by "cleaner air" - that is a new one - let me know if you have any more references on that - thanks again! I hadn't heard about the "cleaner air" connection either. Brian's blog has a link to an article about it, but that's all I've seen. Have you read Bernstein's "Capitalist Manifesto"? That was the first time I had heard of Lysenko and his absurd and ruinous attempt to bend science to Marxist ideology. I shouldn't be surprised to see that Mao adopted them for his "Great Leap Forward." Thanks for the Bastiat reference! What a great absurdist argument mockingly in favor of protectionism... from the sun.